Most organizations deal with the shipment of goods in to and out of their premises. With the increasing demand for a better customer experience it is a challenge to provide a high level of customer service when parts of your supply chain fall somewhat out of your “sphere of influence”. Sure, through contractual obligations, you can try and force your suppliers and carriers to behave in a certain way but as the old saying goes “stuff happens!”. If the supply chain breaks down outside of your 4 walls, are you aware of it? Do you have enough time between when you find out about the issue and the time needed to correct it? Do these issues in the supply chain cause disruption and potentially lead to lost customers and sales? 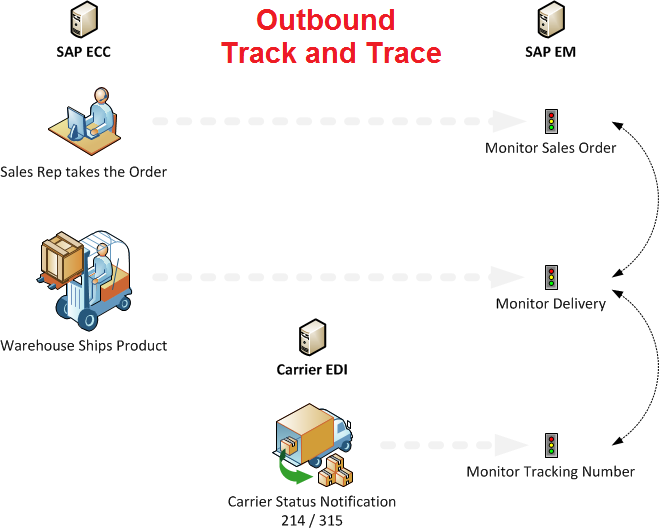 In this article I want to describe how SAP Event Management forms the back-bone of your Track and Trace requirements and specifically focus on the outbound logistics scenario. Firstly let me describe what Track and Trace is and how it relates to my issue described above. TRACK refers to providing me the status of my goods that I am tracking at this point in time – It allows me to answers such questions as: Who has my goods now? Where are my goods? What status are my goods in? When will my goods arrive? Is the person currently in possession of my goods allowed to be in possession of them? TRACE refers to providing me with the historical view of my goods in terms of where they have been, who has handled them, what statuses they have gone through and so forth – It allows me to answer such questions as: Where were my goods manufactured? Who has handled these products to date? Have my goods ever gone in to an “exception” status? Were are the people that worked with my goods authorized and allowed to do so? In the next article I will discuss the inbound logistics process but for now let me describe the outbound logistics scenario. With reference to the above diagram, a sales representative fields a call from the customer and enters the Sales Order in to SAP ECC using transaction VA01 (Note: Many ways can be used to enter a sales order including an EDI 850 ORDERS message). On saving the Sales Order an Event Handler (EH) is created in SAP Event Management (EM) in order to track the sales order’s status. From that point on any changes to the sales order are accordingly reflected against the SAP EM EH so that anyone monitoring the sales order will also receive those updates.Once the Sales Order is complete and ready for fulfillment the Outbound Delivery is created. At this time an EH is created in SAP EM in order to track the delivery’s status. Note that the delivery EH and the sales order EH are linked with each other much like the 2 documents are linked via document flow in SAP ECC. When the outbound delivery is picked and packed, it gets assigned a tracking number/s just prior to shipping the product. The tracking number is used to create a Tracking Number EH in SAP EM in order to monitor the Tracking Number status going forward. Note that the tracking number EH is linked to the outbound delivery EH. This allows for complete upward and downward navigation from any of the applicable documents (Sales Order, Delivery, Tracking Number). Once the carrier makes the first scan against that tracking number/s we will receive a notification from them stating that this event had occurred. E.g. Pick Up. Carriers typically provide an EDI 214 carrier status notification message to give this detail. When we get the EDI 214, we typically use a translation tool (E.g. SAP NW PI) to convert it in to an EVMSTA IDoc and have it post to SAP EM. Each 214 is posted against the corresponding Tracking Number EH and the status updated accordingly. You can see that we can get full visibility for the supply chain members from the sales orders, through delivery and in to the carrier status notification. Next article will be on inbound TnT but for now please feel free to leave me any comments. Kevin Wilson is a SAP Event Management expert with a lot of 1st hand experience with using it for Track and Trace purposes. Should you wish to see a demo or learn more about the solution please feel free to contact him at kevin@erpgenie.com. Kevin is the author of "SAP Event Management - SAP's best kept secret..." published in 2010.